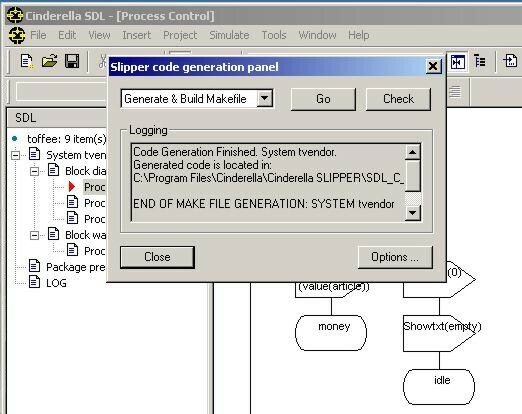 Cinderella SLIPPER is a code generator that builds ANSI C code from SDL specifications created with Cinderella SDL. Cinderella SLIPPER version 1.0 supports basic concepts of SDL-96. As an option, SLIPPER includes generation of the simulation code that may be used for purposes of debugging. Also, SLIPPER allows generation of interface functions to Cinderella MSC, thus obtaining creation of MSC diagrams during the execution of the generated code. SLIPPER provides libraries of kernel functions to run generated code on Windows platforms. The code generated using SLIPPER is compact and user-friendly. Special effort has been made to produce code that is very simple and easy to understand. If necessary, due to the dynamics of the project development, the code can be easily changed by the user. Code generated by SLIPPER may be used for embedded SW projects based on a vast range of microprocessors from Intel-8051 to PowerPC.